Dr. Negola and his team are the best anywhere. They genuinely care for your animals and treat all their clients like friends. When you see Dr. Negola for any reason you can be sure that he is giving your pet a very thorough examination. Bella and I are lucky to be patient and Mom here. LOVE Dr. Negola and his staff. Always friendly, professional, attend to all concerns and needs. I drive 45 mins. to get there--Negola's Animal Care is THE only place I will take my "babies". We have always and will always trust our pets' life and care with Dr. Negola. He's the best! Although Sophie was getting a routine surgery, I was nervous about her getting spayed. Dr. Negola understood how I felt and he called me immediately after Sophie's surgery to ease my mind. And if that wasn't enough, he sent me pictures of her waking up followed by one of her sitting up! Elvis, the tech, met us at the door and was also very compassionate. The office is beautiful and clean and the staff is so caring. I highly recommend Dr. Negola. 5 STARS!!! Blown away by the service provided! Dr Negola & staff are the most caring, professional & experienced group. They truly care about your pet and there’s no one that can diagnose and treat an issue better.He EDUCATED me how to care for my diabetic dog. Priceless information. Dr. Negola is the most hands on veterinarian that I've ever had! He is very aware of my pet's needs and seemed very knowledgeable on what was happening with my pet. Dr. Negola and his staff are so compassionate. They really show how much they care about the well being of your animal. They go above and beyond to make sure that you understand the diagnosis and give you every option to resolve the problem. I feel that my girl is getting top notch care. Dr. Negola is the best...he knows animals and he knew what was wrong with my injured dog as soon as he saw her. Dr. Negola is the best and most caring vet I have ever brought my own pack of dogs and our rescue group's foster dogs to (and I have been to at least three other vet practices)! He is so darn good that I wish he was my own primary care physician! He even calls you personally on the follow up calls to check on your dogs if they were in for surgery or some other illness! Dr. Negola is extremely knowledgeable and is very accommodating! If it is an emergency or something that is important but not quite an emergency, he will fit you in! His staff are all awesome and the facility is extremely clean! My dogs love going to the vet! We all love Dr. Negola! I can't recommend him enough! We have been clients of Dr. Negola for close to 30 years. He has taken care of all our "little people" with the greatest of care. All our animals have had a longer, quality life as a result of Dr. Negola and his staff. When all other vets tell you there is no hope for your pet, go to Dr. Negola. He is the doctor of last resort and has helped us and many of our friends enjoy and love their animals for longer than anyone thought. The best practice I've experienced in 36 years of owning dogs. I am so grateful to Dr Negola and all of his staff for the work that they do. It is a rare thing to find a group of people that truly care and have the level of expertise that Dr Negola's hospital has - I will never take my pets anywhere else! It the best place for my pets! Dr Negola and his staff are very knowledgable and friendly. I know my puppy is receiving the best care and at a reasonable price. Vaccines were 30% off in January....I’ve never experienced that with other vets! 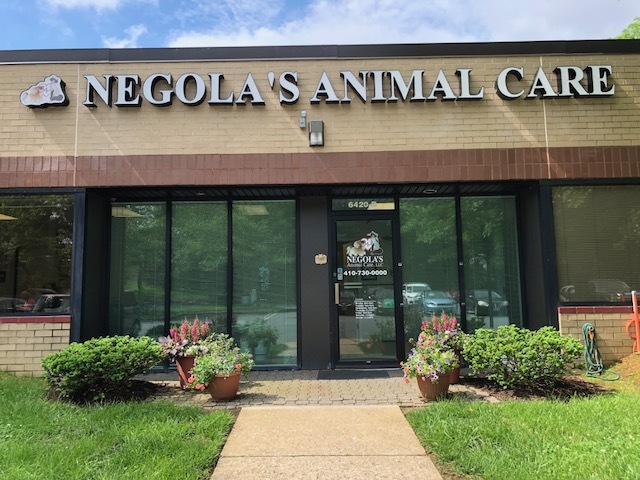 There's just no better veterinary care available in this area than Negola's Animal Care! Dr. Negola is the absolute best. I've followed him everywhere he's been and will continue to do so. He and his team are the best! You guys really care for our pets like they are yours , Thanks for all your caring . Bella is very happy and healthy now . Dr. Negola and his team are the very BEST!! They truly and genuinely care for my dogs’ well-being! Dr. Negola has an excellent reputation so I was excited to learn that he has a practice in Columbia and will be able to care for my new puppy. Many years ago we took our Golden to Gaithersburg, however, the distance got to be too far to continue. Dr. Negola performed an operation on my dog's (Luke's) knees to repair a congenital defect that prevented him from walking. Now he walks, runs and plays like any other dog and is very happy. We still take him to Dr. Negola and he gets the best care. Excellent care by all of the staff, and Dr. Negola is simply the best veterinarian! Perfectly professional and loving care! Every single person we have met working there is considerate, kind, and genuinely interested in you and your pet. The Doctor is OUTSTANDING in his knowledge, and compassion for animals. I would recommend his Office to everyone owning a pet! Dr. Negola and his staff are phenomenal. Not only does my pet receive the best medical care, but she also receives comfort care and is well tended to. I truly appreciate that the staff understands how much I love my dog. Friendly and knowledgeable staff and Dr. Negola treated us like family. Everyone was friendly and kind and positive! This entire facility is leagues above the other offices in the area that I've been to. Best vet, best staff, phenomenal service and commitment to my dogs well being. I recommend Dr. Negola to all my students. Top quality care and expertise. Doc is a seasoned vet and does not do unnecessary tests. You can’t find a vet anywhere else with his experience which is the best teacher of all. Dr. Negola & his staff are outstanding. I started going there 13 years ago. Since he moved, I travel across town-can't find anyone better. He literally saved one of my dog's lives at least five times. I STRONGLY RECOMMEND this practice. Dr. Negola performed a thorough examination of Jedi. He explained everything in detail, found an infection I had no idea about, and diagnosed the reason for his limp in the right foreleg. Fantastic service and support staff. I brought my dog to Dr. Negola because another vet told me she needed Surgery to repair a torn ACL. After examining our dog, Dr. Negola advised against surgery, since the ACL is probably not torn. He gave some pain meds., and supplements to strengthen her joints and she seems just fine. I'm glad we went to see Dr. Negola! I highly recommend his practice. I have complete confidence in Dr. Negola and the staff. Dr. Negola and his staff genuinely care about the welfare of the animals. They are very friendly and knowledgable and we feel that our pet is well-cared for. Absolutely love bringing our new kitten. Very clean and very friendly staff. Compassionate, caring and knowledgeable staff. Dr. Negola is the best! Dr. Negola is very friendly, warm, & he genuinely cares for my dogs when they go see him either for annual exams or for other medical issues. His thoroughness is well appreciated. His support staff is excellent too. I needed to take Sugar, Pree and Boaz into see Dr. Negola. Dr. Negola and the entire staff there knows me and my dogs, by name, and they care what happens to them. LOVE knowing my dogs are so well treated, liked and taken care of. Cleanest pet facility I've ever seen. Warm, knowledgable staff. I can't even say enough about the care that Dr Negola provides, he is the most caring person. If you are looking for the best of the best then he is your doctor. Thank you for taking such awsome care of Petey! Doc is the Best! He has taken care of our dogs for over 15 years! Kim and the rest of the team are awesome also!